Something for the Weekend, Sir? Mi dispiace, non parlo italiano. This would be easier if I'd been armed with a proper phrase book rather than a single page of everyday expressions at the back of my tourist guide. And it would be more effective if I was trying to communicate with a human. I am, of course, talking to a machine. No one else is around, which is to be expected. I am standing by a diesel pump at a lonely petrol station on a stretch of silent road between sleepy towns somewhere in Sicily early on a Sunday morning. Prior to this, I have been filling up the tank during my touring holiday by hailing an attendant and handing him a banknote. I don't need to do this but I enjoy the retro novelty: British petrol stations went fully self-service at least 30 years ago. Now I'm on my own, it should be a simple matter of operating the automated till at the pump. You insert a credit card, enter your PIN, refill the tank, take your receipt and go on your way. How hard can it be? Five minutes later, I am still pressing buttons and trying to navigate the incomprehensible user interface that appears on the till's LCD matrix display. I have yet to persuade it to part with a single drop of diesel, or indeed do anything that might indicate that I am making any progress toward that goal. OK, let's start again at the top menu. Cancel Cancel Cancel Cancel Cancel. I make a fair guess as to what this prompt means as there's a scrolling list of languages next to it. Down Down Down Down, choose "Inglese" and Enter. So much for Inglese. No matter, I'll manage. Inserisci contanti o una carta di credito. Even as I begin sliding my credit card into the slot, the machine is already doing something else. Hang on, I haven't slotted it in yet. Well of course not, you didn't wait until I'd inserted it. How can you check a credit card in the slot before it's in the slot? Si prega di inserire un'altra carta di credito o inserire contanti. Cancel Cancel Cancel. Let's try again. Another 10 minutes of this, three different credit cards and a sequence of progressively arcane payment interface messages in Italian later, I have begun shouting and waving my hands at the machine. This is, after all, the Sicilian way. Your average Sicilian can convey a lot of meaning non-verbally to someone who cannot speak Italian, and vice versa, by waving arms around. Unfortunately, a machine cannot. I am wondering whether they should fit automated till machines in Sicily with robot arms so that we can communicate with each other. I miei capezzoli esplodono di gioia. This isn't the first time I have strayed into a Twilight Zone of cross-lingual and intercultural bafflement during this vacation. Throwing caution to the wind a few days earlier, I'd rashly allowed Google Maps to plot a walking route from the centre of Palermo to La Zisa. Why I did this, I cannot say, especially given my poor experience of Google Maps' walking routes in the past. This is, after all, the app that once directed me to walk through the centre of an unlit Hyde Park at 2am and whose audio inexplicably but routinely barks "Turn left!" when you're supposed to turn right. On this occasion, Google Maps decided to take me on a scenic tour of the city's most impoverished slums. Given that what few pavements existed along the way were knee high in refuse and canine excretia, it was less of a walking route than a wading route. The final 100 metres appeared to be some kind of theme park attraction along the lines of Disney World's "Pirates of the Caribbean", except this was "Dope-addled Inbreds of the Mediterranean". To access this den of iniquità, I had to pass through one of those pedestrian gates design to stop cyclists from riding through it. It was blocked by a tweenager who'd been trying to ride his bicycle through it and got stuck. The unlikely resolution of such an attempt was emphasised by two obvious challenges: it was an adult bike and the boy was so fat that he looked like an inflatable sofa. Both the bicycle and his body were at least two sizes too big for him. By waving his arms around, he indicated that I was welcome to pass through the gate. By waving my arms back at him, I indicated that I would certainly do so after he had extricated himself. This attracted some shifty onlookers who helpfully grunted and waved their arms around at both of us until eventually we were all gesticulating like delegates at a semaphore convention. Fearing an unfortunate outcome from this clash of cultures in unfamiliar territory, I coaxed the fat kid and his bike out of the gate and taught him to play the banjo he was carrying, ending with a spontaneous duet between the two of us. It was only by sheer luck that I'd remembered to pack my bagpipes. Anyway, I digress. Back at the petrol pump, the payment machine is leading me into its own kind of Deliverance-like denouement and I can no longer decipher the messages on the LCD display. It has now accepted my card and seems to be asking me to choose a pump. I press the appropriate number. Nothing happens. FFS. Why can't they make automated payment machines work the same way all over the world? Cancel Cancel Cancel. Is it asking me for my PIN? Voglio che tu strilli come un maiale. Nope, no idea what's going on here. But then a Fiat Tipo rolls up alongside and Inspector Montalbano gets out to refill his tank and cooly solve a murder case while wearing sunglasses. A notorious computerphobe, Salvo ignores the display prompts on the automated payment machine, stuffs a €50 note in it and starts filling up while casually munching on arancini. Paying cash appears to circumvent having to use the user interface entirely. A minute later, I am on my way with a full tank, musing on which of Dante's levels of Hell ought to be reserved for automated retail payment user interface designers. Non capisco tutte queste minchiata. 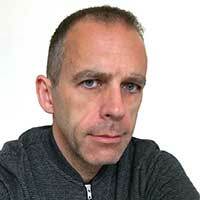 Alistair Dabbs is a freelance technology tart, juggling tech journalism, training and digital publishing. He has noticed a marked difference in how he is treated in foreign climes depending upon whether the person he is trying to communicate with believes him to be English or American. As soon as he admits to being English, he can see the sparkle in the other fellow's eyes fade into one of sympathy.